Jean Bruel had already imagined 9 cruise boats, encased in glass and bathed in light. They represent up the company’s current fleet. He himself designed and built really modern and avant-garde boats. One of them is enclosed, with heating and air conditioning, and has a glass roof and sides. It offers an incomparable view of all of Paris’ beautiful sights, while being sheltered from bad weather. 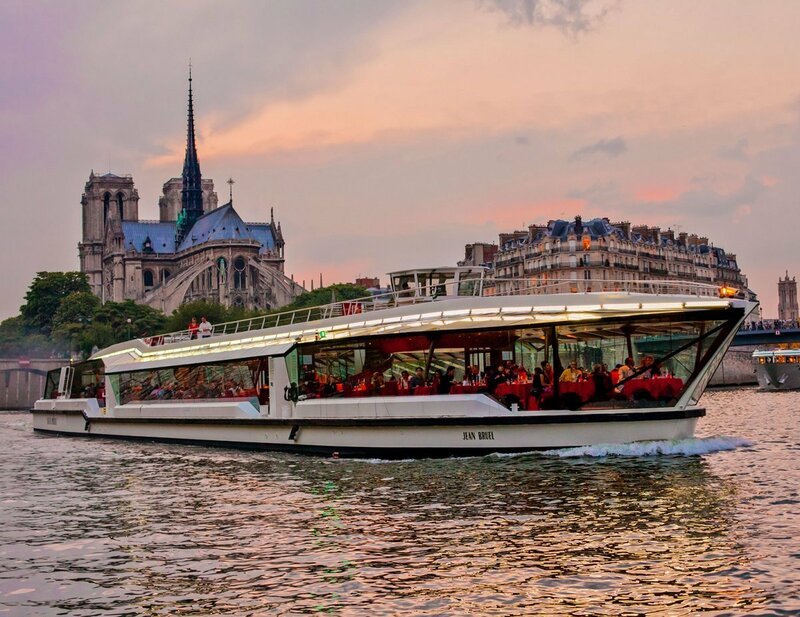 The other one has an open deck, which enables passengers to take advantage of all of the magic of the City of Light and provides a 360° view. All of our boats are regularly renovated and decorated so that they remain at the cutting edge of technology and in keeping with current tastes. Cruise trips: departures every day, all day long and in the evening. Named after an amusing '70s joke which has been perpetuated. Bateau Mouche (river boat) built in 1955 at Le Havre Shipyard. The majestic flagship of the fleet, which is encased in glass and bathed in light. Ultramodern equipment ranging from a multi-directional propulsion system to GPS satellite receivers ensure reliable, safe and smooth sailing. An exceptional location where violins and a piano are played in harmony and highlight a refined and perfect culinary art, allowing each guest to keep a warm memory of his prestigious dinner cruise. The Excellence Menu is served on small tables, close to the windows. Romantic candelabras. Red and gold decor. Baroque artwork. Semi-private areas at the rear of the boat, accommodating from 12 to 50 covers. Open upper deck to enjoy the heart of historical Paris close up. Meals are prepared to order by a chef and his team on board. Regular daily service. Individual and business dinners, small receptions. A capacity of 200 covers. Named after the big barges which transported goods to Lépante, on the river ways in Dordogne and the South of France, the Bateaux Sauniers (which transported salt). Bateau Mouche (river boat) built in 1976 in Le Trait, Rouen. Renovated from 1985 to 1989 at the Le Havre Naval Shipyard. 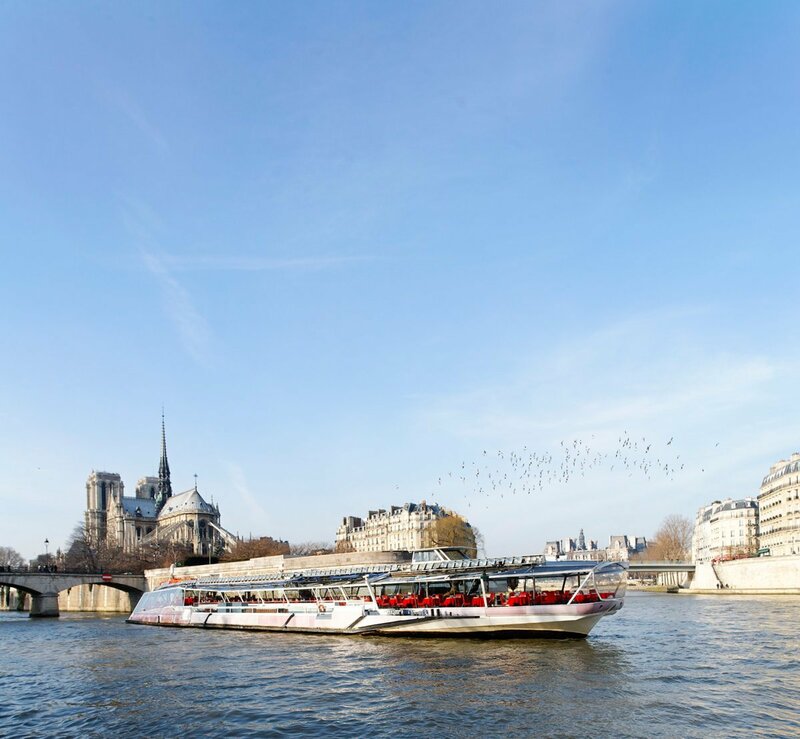 The biggest and the most powerful of the Bateaux Mouches®. It has a 2000 HP engine, four 400 KVA diesel-electric generators, 2 hydrodynamic propellers and is double-ended. A majestic boat 80m long and 11m 40 wide. A spacious, bright and very comfortable boat. Red and black decor, with a light oak wooden floor and red leather chairs. Elegantly fitted out area for top quality receptions. Area with heating and air-conditioning. Rectangular and round tables for 4 to 8 covers. Privileged area at the front and private reception room at the rear of the boat. Uncovered 600m² upper deck to enjoy magical moments in the open-air. Private service from 300 to 550 covers. Receptions and cocktails. Named after the Royal paddle boat which provided the service from Paris to Saint-Cloud in the 19th century. Renovated in 1983 and 2002. It has an independent self-propelled 300 HP engine. It has a "power" annexe which houses a kitchen, a storage area and a lighting generator. A boat specially built with a low design to sail to the deepest navigable waters. Interior deck covering 180m², with heating and air-conditioning. Wooden floor. Elegant and simple decor situated in an area covering 100m² whose windows are at water level. It has a glimmering midnight blue ceiling and globes on the tables. Rectangular tables accommodating 8 and 6 covers. Open 220m² upper deck with teak furniture. Meals are prepared to order by a chief and his team on board. Private service for up to 100 covers. Cocktails and small receptions. Named after the customs boats whose officers had "a disorderly way of life…"
Bateau Mouche (river boat) built in 1958 at Le Havre Shipyard. Double hydrodynamic propulsion system, with an 800 HP engine for safe and rapid sailing. A superb boat, 60m long and 10m wide. Wide retractable side picture windows, with a steel structure. Amber-coloured decor, with a light oak wooden floor and red leather chairs. Heated area. Rectangular tables for 10 to 12 covers. Private reception rooms at the front and rear of the boat. Roof at the rear of the boat accommodating 70 covers. Dance floor. Uncovered 100m² upper deck to enjoy magical moments in the open-air. Private service from 150 to 350 covers. Receptions and cocktails. Named after infantry regiment who were responsible for Napoleon III's first victory in Crimea. Of the four initial statues positioned on the Pont de l’Alma, only "the Zouave" by Georges Diébolt remains, which is used to measure the River Seine’s water levels today. Bateau Mouche (river boat) built in 1985 at Le Havre Shipyard. 60m long, 10m wide. 800 HPengine. Equipped with Voith and Schottel propellers. Can sail in the deepest navigable waters. An original place for a reception which combines a remarkable drawing room and a colourful decor: a red glimmering ceiling, glass and steel sides, red chairs and a wooden floor. Heated and air-conditioned area. Round tables. Covered walk on the front deck with a private bar. Dance floor. Possible to have a stage or a cabaret style production. Superb, spacious and welcoming outdoor area covering 400m², which is completely open. Private service from 80 to 250 covers. Receptions and cocktails. Ther crew is waiting for you on board one of 9 boats enclosed in glass and bathed in light to cast off and accompany you on a journey through time. Daily departures throughout the day and in the evening. 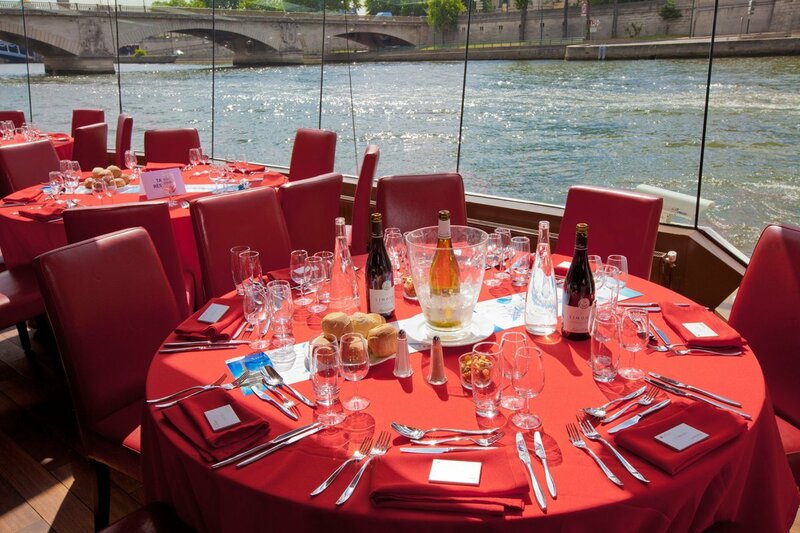 The 5 boat restaurants of the Compagnie des Bateaux-Mouches® travel all over Paris every day to reveal the heart of the City of Light. 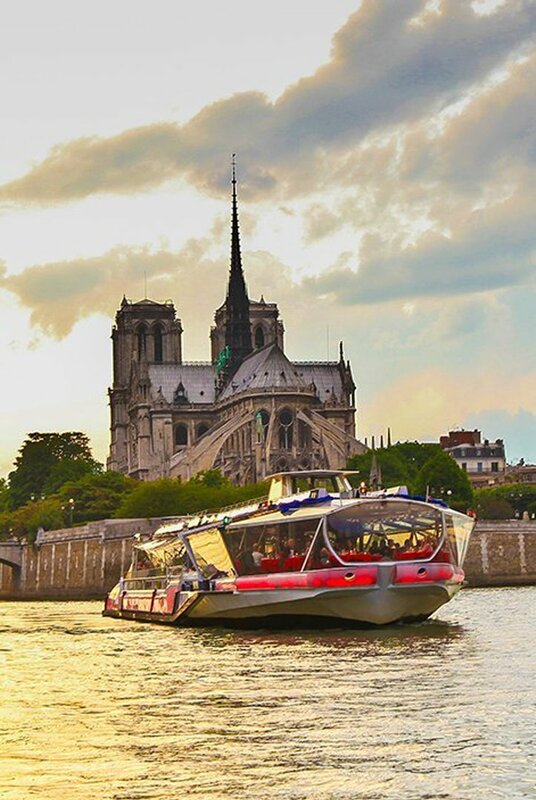 They will allow you to discover or rediscover all of the magic of the banks of the River Seine, which are enhanced, in no predictable order, by the most prestigious monuments which have marked history. 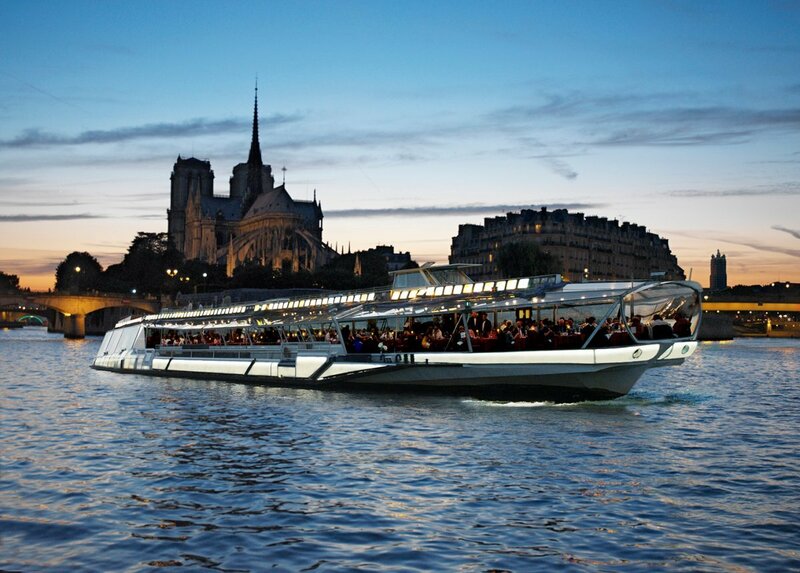 Boarding: Pont de l’Alma, Paris, the 8th arrondissement from 7.30 p.m. to 8.15 p.m.